Sanath Jayasuriya proved to be India’s nemesis yet again as he defied a painful shoulder injury to steer Sri Lanka to a thrilling three-wicket victory in the opening match of the Indian Oil Cup cricket tri-series here today. Mizoram is agog over the increasing trend among youths to get involved in the game. Just five years ago, only a handful of Mizos could tell the difference between a Test match and an ODI or a leg glance and a cover drive. Top seed Andre Agassi powered into the semifinals of the Los Angeles Open with a 6-2 4-6 6-4 win over Thailand’s Paradorn Srichaphan yesterday. Agassi (35) back in action for the first time since the French Open two months ago, moved within two victories of his fourth title here. International Master S. Satyapragyan missed out on his chances of winning a Grandmaster norm after going down to local favourite GM Petr Haba in the eight and penultimate round of zech International Open chess tournament here. IM S. Kidambi played another fine game to beat Erik Zude of Germany to emerge as the only Indian in with a chance for a shared top place. Narain Karthikeyan completed a clean race in trying conditions and is now hoping for a finish for the second Sunday in succession while Michael Schumacher grabbed his first pole position of the season in the qualifying session for the 13th Grand Prix on the Hungarioring circuit today. Tiger Woods equalled the course record with a stunning 11-under-par 61 to move within one shot of leader Vijay Singh after the second round of the Buick Open in Grand Blanc, Michigan yesterday. Back in action for the first time since the British Open earlier this month, the top two players in the world rankings took control of the leaderboard. Riding the momentum of his win at St Andrews, world number one Woods reeled off seven birdies plus back-to-back eagles at the 13th and 14th holes to finish on 12-under 132 at the Warwick Hills Golf and Country Club. Doctors have given inputs to the government on how to go about establishing medical facilities for the 2010 Commonwealth Games. At least 150 sports medicine specialists and others specialising in various branches of medicine got together to deliberate on the preparations for the games. The doctors detailed the requirements, the likely problems, the equipment, the personnel required and other related matters. France’s Christine Arron won her third straight 100-metre race and Tatyana Lebedeva claimed her third consecutive triple jump victory in the Golden League at the Bislett Games yesterday. Two world records tumbled at the World Aquatic Championships as Aaron Peirsol and Leisel Jones spearheaded powerful performances for US men and Australian women. Peirsol’s dominant victory in the 200m backstroke in one minute, 54.66 seconds launched a US sweep of the three men’s golds on offer yesterday. Khalsa Collegiate School, Jalandhar, defeated St Mary School, Amritsar, 5-0 in the inaugural match of the Punjab Women’s (u-19) Football Championship at Gurusar Sadhar, near here, today. After restricting India to 205 for nine on a difficult batting track, the hosts were gasping at 140 for seven at one stage before Jayasuriya (43 not out) guided the team to safety with 10 balls to spare in an absorbing floodlit encounter at the Rangiri stadium. The flamboyant left-hander dislocated his right shoulder while fielding, but showed no signs of discomfort as he relied on his experience to tilt the balance in favour of the home team in the low-scoring tussle. The Indians, desperate to launch the new season on a victorious note, put up a spirited display, with captain Rahul Dravid deploying an attacking field right through, but ran out of steam towards the end. The hosts also relied on rookie allrounder Ferveez Maharoof and Dilhara Lokuhettige to bail them out. Maharoof, who was the most troublesome bowler after Muttiah Muralitharan, denied the Indians the one final breakthrough they were looking for by combining with Jayasuriya for an unbroken eighth wicket stand of 37 runs to see the hosts home. Debutant Lokuhettige’s contribution with the bat was as crucial as that with the ball, his 20-ball 21 containing three fours and a six, adding 28 vital runs from as many balls for the sixth wicket. As with the Indian innings, the Lankan lower order was more productive than the top, negating the fine captaincy of Dravid, who showed imagination in rotating his bowlers and field placement. The absence of a fifth specialist bowler then proved to be India’s downfall. India’s total of 205 for nine seemed to be a modest one, but turned out to be more challenging, an indication of low-scoring games to come in the tournament. India began the defence of their total well enough when Irfan Pathan won a leg before shout against Kumara Sangakkara (14) in the fifth over. Marvan Atapattu (29) and Mahela Jayawardene (15) seemed to be running away with the match with a sedate second wicket stand before the brilliance of debutant Suresh Raina from square leg opened up the game for India. Raina darted down from square leg to throw down the striker’s stumps with just one wicket to aim at and caught Atapattu short of his crease. Zaheer Khan then cleaned up Jayawardene and when Harbahjan Singh made a twin strike, Indians smelled an unexpected win for themselves. Harbhajan won a leg before appeal against Tillekaratne Dilshan (17) and later bowled Russel Arnold (22) to leave Sri Lanka reeling at 112 for five. Jayasuriya from now on shouldered the innings and even as Pathan and Zaheer Khan chipped in with a wicket each, the hosts were inching closer to their target all the while. Earlier, India’s batting woes in the Emerald Isles came to the fore again after they were restricted to 205 for nine. Captain Rahul Dravid had the unenviable job of nursing an injury hit line-up after the side slipped to 64 for five at the sea-front venue. Dravid topscored with 54 as he led the recovery process through a 58-run sixth partnership with rookie Andhra batsman Y. Venugopala Rao. Rao’s steady innings of 38, particularly the way he handled Muttiah Muralitharan, was a bright note for the Indians after the inept performance of the top order. Irfan Pathan (21), Harbhajan Singh (20 n.o.) and Zaheer Khan (20) provided the late spark that propelled the Indian score past the 200-mark, which at one time looked improbable. Muralitharan blew holes in the myth that the Indians were better players of spin bowling as he repeatedly deceived them with his variations. The off-spinner claimed three for 33 while right-arm pacer Ferveez Maharoof was another bowler who troubled the batsmen with his disconcerting bounce. The day brought the much feared bad news that V.V.S. Laxman’s back strain did not subside before the match as it was hoped. But the hosts were not without their worries when Sanath Jayasuriya injured his right shoulder in trying to stop a shot and came off the field in visible pain. The news from the dressing room was that he had a minor shoulder dislocation and should be fit to bat in the evening. 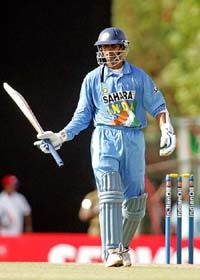 Virender Sehwag (14) shot off the blocks as only he could before Maharoof bowled him with a perfect leg-cutter in the third over. It started a procession of wickets, in which newcomer Dilhara Lokuhettige played a key role, getting past the defence of Mahendra Singh Dhoni (2) and then inducing Yuvraj Singh (12) into an ill-judged pull, that stood up in the swirling wind for mid-on. His first spell of 2 for 24 from eight overs was a dream start to his career. It only worsened when Mohammad Kaif (8) timed a push sweetly but uppishly to mid-on and then Suresh Raina (0), another debutant, was done in by a Muralitharan “doosra”, which he shaped to cut and found it curl back on his back pad. Raina was replaced by another debutant Venugopala Rao, who showed calm in turbulence and strung together a valuable stand with his skipper. Leg-spinner Upul Chandana then got Sri Lanka the wicket they were looking for, clean bowling Dravid with a perfectly pitched leg-spinner, which spun behind the batsman’s legs and hit his stumps. Dravid’s 54 was priceless in the context of the game and he batted for 96 balls and hit five fours to spare India the blushes. Rao then stretched the Indian innings with a well-compiled 38 and in association with Irfan Pathan (21), put on 37 runs for the seventh wicket. Once Muralitharan returned, he snuffed out their resistance in two successive balls. Pathan, completely bemused by the trickery of Muralitharan, tried to hit his way out of trouble and succeeded only in holing out to deep midwicket. Next ball, Rao tried to cut and edged a catch behind the wickets. Rao batted for 74 balls and hit three fours in 38 runs while Pathan’s resistance lasted 32 balls with two fours. If India could still last the 50 overs, it was because of plucky batting by Harbhajan Singh and Zaheer Khan, who put on 43 runs from 34 balls for the ninth wicket. Harbhajan’s knock from 23 balls included a six and a four while Zaheer needed only 12 balls for his runs and hit three fours. Fall of wickets: 1-17, 2-22, 3-44, 4-63, 5-64, 6-122, 7-159, 8-159, 9-202. Bowling: Maharoof 9-0-27-1, Lokuhettige 10-2-31-2, Fernando 10-1-61-1, Muralitharan 10-1-33-3, Chandana 5-0-26-1,Dilshan 3-0-14-0, Arnold 3-0-7-0. Fall of wickets: 1-19, 2-55, 3-60, 4-104, 5-112, 6-140, 7-172. But the cricketing pitch on the average Mizo mindset is changing. This hitherto football-crazy north-eastern state now swears by the nation’s favourite game, thanks to efforts of the Mizoram Cricket Association and the influential Central Young Mizo Association. As a direct spin-off, the Mizo drum called “khuang” has also carved out a new roll for itself — a different place in the sun. For the first time, the rhythmic sound of the “khuang” added to the adrenaline rush during each ball being bowled at the Inter-Branch YMA Cricket Tournament held here recently. The cricket fans brought along with them their drums to the ground to pep up the proceedings. The eight-times Grand Slam champion, who has been sidelined with a nagging hip injury, broke serve twice in the opening set and gained another break to lead 2-1 in the second. But world number 44 Paradorn broke back in the sixth game and went on to level the match when Agassi double-faulted. The American regained the initiative early in the third set before clinching victory on his fifth match point. ‘’It felt good,’’ Agassi told reporters. ‘’It’s been hard the last eight weeks to be sitting around watching the biggest tournaments in the world pass you by. ‘’But I’m committed to never again being on court when I’m just limping along, if I’m not healthy I won’t be playing. Agassi, who won this title in 1998, 2001 and 2002 and also lost in the final in 1988 and 1999, now plays Argentine Juan Ignacio Chela who defeated Belgian Xavier Malisse 6-4, 7-6. STANFORD (CALIFORNIA): Wimbledon champion Venus Williams out-slugged Jelena Jankovic to move into the semi-finals of the Stanford Classic. Williams will face third seed Patty Schnyder, who trounced Iveta Benesova 6-2, 6-1. Former Stanford champion Kim Clijsters was also impressive, beating Daniela Hantuchova 6-3, 6-1. She will face German 20-year-old Anna-Lena Groenefeld in the semi-finals, who upset sixth seed Nathalie Dechy 2-6, 6-2, 6-3. Williams was her normal vigorous self, chasing down deep groundstrokes to the corners and powering them back for winners in yesterday’s match. The second seed served efficiently, volleyed cleanly and impressed the seventh seeded Jankovic with the extent her power. Although Williams was pushed by the fleet Serbian in some extraordinary end-to-end rallies, the outcome was never in real danger. Clijsters, who recorded her sixth win over Hantuchova in six meetings, frequently attacked the Slovakian’s second serve and outplayed her from the baseline. Schnyder has been on fire on US hard courts, winning the tournament in Cincinnati last week and easily brushing aside her opponents here. After winning her 40th match of the year, the 26-year-old Swiss said she was playing her best tennis ever. International Master S. Satyapragyan missed out on his chances of winning a Grandmaster norm after going down to local favourite GM Petr Haba in the eight and penultimate round of zech International Open chess tournament here. IM S. Kidambi played another fine game to beat Erik Zude of Germany to emerge as the only Indian in with a chance for a shared top place. Kidambi had tallied 6 points from 8 games. The tournament was thrown open by Russian GM Vladimir Potkin, who scored a hard-earned victory over tournament leader IM Valeri Shalimov of Ukraine. As a result, GM Evgeny Najer of Russia, IM Mikhailo Oleksenko of Ukraine, GM Andrei Potkin of Belarus and Potkin emerged as joint leaders with 6.5 points each in their kitty. The fifth place was shared by 13 players, including Kidambi, with just one round remaining in this 332-player event. Satyapragyan was well aware about his chances of winning a GM norm and obviously, did not want to risk a victory with black pieces in the last round game. However, his scheme backfired as Haba turned out to be a superior player. The Indian was now out of contention for the GM norm. Kidambi, on the contrary, knew that his chances of winning a GM norm were remote as he did not meet the required conditions and just concentrated on playing his best. Kidambi had displayed fine form in the past few months and his victory over Zude Erik of Germany came as little surprise to everyone. Sandipan Chanda, after three straight victories, was halted by another German David Hausrath who played black. Chanda definitely wanted to do better than a draw in the closing stages of the tournament but the defences of Hausrath proved stronger in the end and the German squeezed out half a point from the match. Chanda had 5.5 points. Also moving to the same score as Chanda was another Indian, GM Tejas Bakre, who defeated Ejsmouth Krzysztof of Poland in nonchalant fashion. Playing white, Bakre took no chance and concentrated well enough to romp home after outplaying his opponent in all departments of the game. Karthikeyan, who left as fourth driver after his teammate Tiago Monteiro returned to the stands with no times, finished 18th, clocking 1 minute 25.057 seconds ahead of Robert Doornbos (1.25.484) in a Minardi. Seven-time world champion Michael Schumacher, who was fastest with 1:19.882, is now just one mark away from making a history of maximum number of pole positions. Juan Pablo Montoya of McLaren-Mercedes was second (1.20.779) and Jarno Trulli of Toyota Panasonic was third (1.20.839). Karthikeyan said he was pleased to have completed a “clean” lap in difficult conditions. “I am pleased to have completed a clean lap for qualifying under these very hot conditions. At the end, I am positioned between our two most direct competitors which gives us a good indication that they are on different fuel load - and as this is so important for the race it may really be different on their two cars. Team Jordan worked on the technical aspects well during the practice sessions which showed in the session as the 28-year-old Indian improved upon his time during his 14 laps. “This morning I completed 14 laps in the fourth session, improving my time to 1.24.265. I had completed 10 laps in the earlier session as the temperature was not so hot with a time of 1.25.721. I can say that we made good progress with chassis set-up during the final two practice sessions,” Karthikeyan said. Schumacher, who has had only one top finish this season at Indianapolis when only six cars using the Bridgestone tyres took part, would be looking for another podium finish tomorrow to displace Kimi Raikkonen from the second spot with just seven races remaining in this season. “It was a good lap. I am delighted. It is a good feeling after such a long time to be in such a good position. Today as well as all this week-end we have been very competitive. I suffered a lot this year,” Schumacher said. The German said he was encouraged by team-mate Ruben Barichello’s results in Friday practice. Tiger Woods equalled the course record with a stunning 11-under-par 61 to move within one shot of leader Vijay Singh after the second round of the Buick Open in Grand Blanc, Michigan yesterday. Back in action for the first time since the British Open earlier this month, the top two players in the world rankings took control of the leaderboard. Riding the momentum of his win at St Andrews, world number one Woods reeled off seven birdies plus back-to-back eagles at the 13th and 14th holes to finish on 12-under 132 at the Warwick Hills Golf and Country Club. Champion Singh was less spectacular but a tidy 66 gave the world number two from Fiji a 13-under total of 131. Woods collected five birdies in seven holes from the third and opened the back nine with three pars before embarking on a magical stretch which yielded his two eagles and birdies on 15 and 16. The 29-year-old American then had to sink a tricky putt to save par on 18. ‘’I really didn’t want a bogey on 18 and leave the round with a sour taste in my mouth. I would hate to have made bogey there and I really grinded on that putt.’’ Vijay Singh, twice a winner of the Buick, sprinkled his round with seven birdies and a single bogey. 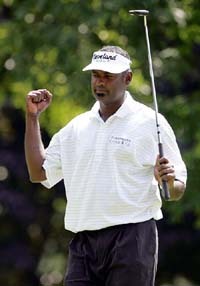 ‘’I think being familiar with the golf course helps,’’ said Vijay Singh. ‘’We are used to coming here. ‘’You don’t think about it, you get on a tee and you know what club you’re going to hit. There’s not too much thought behind it. Two strokes off the lead on 11-under 133 was Craig Barlow (67). The day-long National Seminar on Sports Medicine, with the ‘Commonwealth Games 2010 — Challenges to Sports Medicine’ as the theme, was organised by the Indian Federation of Sports Medicine in association with the Sports Authority of India (SAI) at the Nehru Stadium here today. The conference was attended by doctors from all over the country and top sportspersons and administrators. “We need to prepare for any kind of eventuality,” suggested the Chairman of the Commonwealth Games Technical Conduct Committee, K.P. Singh Deo. Delhi was well-equipped with speciality hospitals and what the government needed to do was to expand the facilities, recruit more medical personnel and make modern medical technology and equipment available to organisers. India had the doctors to deal with any eventuality, provided the facilities were put in place well on time. The doctors suggested that the medical centres start functioning 15 days before the games and continue three days after the closing ceremony. The suggestion was to create a network of medical aid facilities and place those throughout the games venues. For this, the help of corporate hospitals should be sought to make it a public-private partnership for the successful conduct of the games. The doctors suggested that doping and gender verification should be kept away from the medical centres and should be dealt with by a specialised group. The games should be utilised to promote the Indian way of holistic treatment like yoga, meditation and ayurveda. “The main purpose for organising this seminar was to make the government aware of the medical requirements for the games,” said Dr P.S.M. Chandran, Director of Sports Medicine with the SAI in Delhi, and the moving force behind the seminar. The seminar was also attended by Dr Vece Paes and Dr H.L. Nag, who was the organising secretary of the seminar. But Lashinda Demus, who won the first two 400-metre hurdles races in the series, stumbled near the finish line and wound up third. Sandra Glover capitalised on her fellow American’s misfortunes to win the race in 53.93. Poland’s Anna Jesien was second in 54.43 and Demus third in 54.59. Arron overcame some minor problems midway to win the women’s 100m in 11.06 seconds, beating three Americans. Lauryn Williams finished second in 11.16, Latasha Colander third in 11.17 and Rachelle Boone-Smith fourth in 11.23. Lebedeva leaped 14.89 metres for her triple jump victory, despite jumping in pain. France got another win when Ladji Doucoure took the 110-metre hurdles in 13.00. It was just three hundredths off his world-leading fastest time of the year. Doucoure finished ahead of three Americans, Joel Brown (13.22), Terence Trammell (13.27) and Allen Johnson (13.34). Dahame Najem Bashir of Qatar won the Dream Mile in 3 minutes, 47.97 seconds for the fastest time of the year. Kenya-born Bernard Lagat, who recently became a US citizen, was runner-up in 3:48.38. The relay team of Michael Phelps, Ryan Lochte, Peter Vanderkaay and Klete Keller rounded off the night with a victory in the 4x200m freestyle in 7:06.58, the second fastest ever recorded. In between, Brendan Hansen completed a breaststroke double with a victory in the 200m, but could not improve his own world record. That left the breaststroke record breaking to Jones, who also completed a breaststroke double with her win in the women’s 200m in 2:21.71. Australia also took the only other women’s gold up for grabs as world record holder and Olympic champion Jodie Henry won the 100m freestyle in 54.18. Peirsol’s world mark was his second world record of the year, after a 100m backstroke record in April. Unlike many of his peers, Peirsol was showing no signs of letting up after an Olympic year capped by a backstroke double in Athens. Peirsol won his third straight 200m backstroke world title in dominant fashion, with Austrian Markus Rogan taking the silver 1.97 seconds behind in 1:56.63. American Ryan Lochte was third in 1:57.00. “His feet are about this big, and that is all you see,” Rogan said of racing Peirsol. Peirsol had not lost in the zoom backstroke since taking silver at the Sydney Olympics. “I am starting to feel possessive about it,” he admitted. For Jones, who regained the 200m breaststroke world record she had surrendered to Amanda Beard of the USA last year, the victory was further proof that she had broken through whatever barrier prevented her from performing her best in major championships. She first made the Australian Olympic team at the age of 15 in 2000, but only claimed her first individual gold at a major international meet when she won the 100m breaststroke here. Like Peirsol, Jones led wire-to-wire and was under world record pace at every turn. Germany’s Anne Poleska was second in 2:25.84 and Austrian Mirna Jukic was third in 2:27.11. In the men’s 200m breaststroke, Hansen looked determined to join the ranks of record breakers, but he could not sustain the pace and finished in 2:09.85. Hansen was still a comfortable 1.37seconds ahead of silver medallist Mike Brown of Canada (2:11.22), with Japan’s Genki Imamura taking bronze in 2:11.54. Henry never looked like matching her 100m freestyle world record, but she swam a storming second lap to win in 54.18 seconds. The 21-year-old improved on the silver medal she earned in the event at the 2003 World Championships in Barcelona, and added the title to the Olympic gold she won in Athens last year. European champion Malia Metella of France and Olympic backstroke gold medallist Natalie Coughlin of the USA tied for second place in 54.74. The men’s relay saw Phelps pull double duty once again. He posted the second fastest men’s 100m butterfly semi final time shortly before leading off the relay. It was the same squad that captured gold in Athens, and they ended Australia’s string of three world titles in the event. Left-out Harpreet Kaur scored in the 10th, 15th, 44th and 50th minutes while Bhupinderjit Kaur struck in the 17th minute to give their side a flying start. The second match, played between Little Star School, Bhamipura, Jagraon, and HMV Collegiate School, Jalandhar, ended in a 1-1 draw. Manpreeet Kaur of Little Star School put her side ahead in the 15th minute and five minutes later, rival team’s centre forward Amrit Kaur restored parity. In the third match, Government Senior Secondary School, Kalakh, trounced HMV Collegiate School, Jalandhar, 8-1. Amanjot Kaur scored four goals while Harshdeep and Gurmeet Kaur scored thrice and once, respectively. Mandeep Kaur was the lone scorer for the losers. The last match of the day, played between Little Star School, Bhamipura, and Government Senior Secondary School, Kalakh, was a one-sided affair. The final score was 6-0. Manpreet Kaur scored four goals while Maninder struck twice.